Indianapolis, IN. (March 29, 2019) VRI – Friends and family hope camera footage will help find the person who punched James Yacconi and broke his jaw. 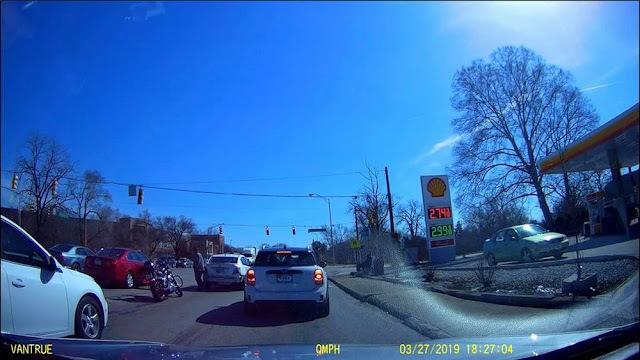 The incident happened Wednesday, sometime between 3:45 and 4:30 p.m., at the intersection of South Madison Avenue and Pleasant Run Parkway. The two had stopped at a red light when the driver of a white sedan got out of his vehicle and confront Yacconi on his motorcycle. After the two exchanged some words, the driver of the car punched Yacconi, knocking the Army veteran into another car. Video shows the entire incident. Moments after the punch, the driver got back in the car and drove away. Yacconi looked confused to what happened. A friend of his said Yacconi drove home, about three miles away, before deciding he needed to go to the hospital. "James is a big guy," the friend said. "You can see in the video. He’s a wrestler, he can take a punch. "So, when that guy sucker punched him and it knocked him into the other car, it broke his mandible and it broke the other side of his jaw when he hit the other car." Yacconi's wife said James spent 16 years in the Army. People who know him are surprised one punch could take him down; they think the driver used something to deliver a more forceful attack. Yacconi's wife said her husband went to the VA hospital, but staff transported him to Methodist where he had surgery. As of Friday afternoon, Yacconi was still in the hospital and his family said James is dealing with some further medical complications. "He stopped breathing," Yacconi's wife said. "That’s a scary thing to watch someone go through." Friends and family were able to get the video from a Lyft driver. In fact, the driver who owns the footage can be heard saying he knows the man on the motorcycle, Yacconi. The roughly five-minute clip begins a couple minutes before the punch is thrown. In it, Yacconi rides next to the Lyft driver and tells him he has a broken taillight. The Lyft driver tells Yacconi thank you. A few seconds later, the driver who threw the punch is seen passing Yacconi on his motorcycle. The next time the two cross paths is at the stop light. James' friend said he thought the driver of the sedan was in a white Nissan Sentra that is missing its rear bumper. He said friends have already begun collecting money as a reward for any information that leads to an arrest. "I hope someone knows who it is and calls the cops," said the wife. "Please. They need to. He could do this to someone else." A police report was filed with Indianapolis police. Anyone with information should give police a call. Tips can be reported anonymously to Crime Stoppers of Central Indiana at 317-262-TIPS (8477).